Note: If you’re looking to upgrade your current v1.1.0 to v 1.2.0 head on over to our documentation. We’re happy to introduce the next release for the Aion Desktop Wallet. The focus of this release is exclusively on maintenance and functionality of the Wallet. A lot of plumbing has been reworked in the backend of the wallet as a result of this. To keep track of the changelog to this release of the Wallet, it’s best to head over to our v1.2.X project. We made the wallet lighter, previously we talked to ledger through a different separate process in the background, either through node.js or golang applications. We’ve rewritten the Ledger HID driver to interact directly with the JVM, allowing us to simplify our packaging and remove these external dependencies. We’ve given the wallet a light UI rework, especially true on the send pane. This should clear up a lot of the confusion users previously had with each tab. Plus the requested send all feature is now available. We’ve improved packaging on all platforms. Upgrade should be a drag (on MacOS), an install (on Windows), or an unzip (on Linux) away. Anything related to your account remains untouched. We’ve fixed a bunch of bugs that you guys have been reporting! We welcome and thank for any and all contributions to our technical developments and encourage your ongoing feedback regarding our v1.2.0 release. For further documentation concerning Aion, please refer to our documentation. 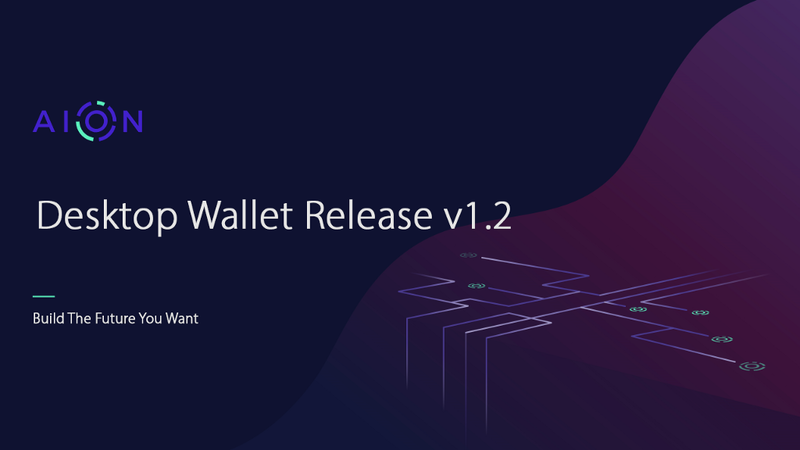 Desktop Wallet Release v1.2 was originally published in Aion on Medium, where people are continuing the conversation by highlighting and responding to this story.